We have a wide selection of Sweets with logo at Calendar Lady Promotions. Including rock sweets, which are hand rolled and have your logo through the whole sweet. 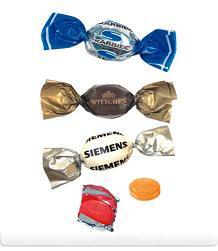 So why not have your company details and logo advertised on our Sweets with logo? It's an extremely cheap promotional item for you to give away to your customers? From Mint Cards and Chocolates, to Sweets with logo on the wrapper to Loppi-pops. View the full rage of Personalised Sweets here. Other promotional and personalised items besides our Sweets with logo click here. To find out more about our Sweets with logo click here and fill in the contact form and we'll get straight back to you.